KANDAHAR, AFGHANISTAN: An important district in Afghanistan’s southern poppy-growing province of Helmand has fallen under Taleban control after heavy fighting that killed around 17 police and wounded up to 10 others, an official said yesterday. The fall of the district, which borders Pakistan and major poppy-producing districts, means “Taleban are in control of 60 percent of Helmand,” Akhonzada said. Much of the area of Marjah, Sangin, Garmser and Dishu districts have already fallen to the Taleban, he said. 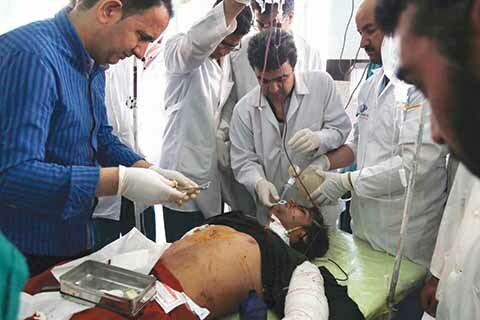 The district police chief and deputy head of the local branch of the national intelligence agency were critically wounded in clashes, he said. The central authorities have been trying for many months to convince rural districts to reduce the number of police checkpoints, as they are manned by small numbers of policemen who are vulnerable to Taleban attack. They want to consolidate the checkpoints, so that there are fewer of them but each one is more heavily-manned and less vulnerable to attack. Residents, however, prefer the regularly-spaced small checkpoints, officials have said, as they make them feel safe. Kanashin is a major drug smuggling route. Helmand produces most of the world’s opium, the raw material of heroin, which helps fund the Taleban’s insurgency. The Taleban have been fighting to overthrow the Kabul government since 2001, when their regime was ousted by the US invasion. The insurgents consider Helmand, along with neighboring Kandahar province, to be their heartland. Elsewhere yesterday, explosives hidden in a fruit cart at a market in the western city of Herat killed two people and wounded six others, according to Abdul Rawoof Ahmadi, spokesman for the provincial police chief.